Care manager Chris Caldicott retired after 15 years, along with husband Dave who has also worked at The Lawns for seven years, while senior team leader Becky Tolley was leaving after 11 years. 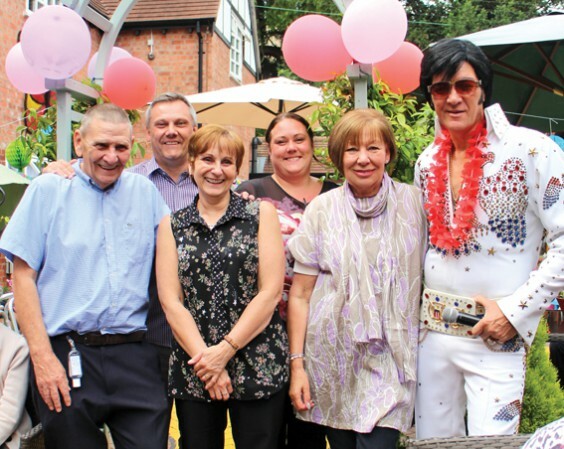 As Chris is a big Elvis fan, there was entertainment by “The King” (Dave Dixon), as well as plenty of fizz and a special cake made by housekeeper Lyn Farmer. Above, from left: Dave Caldicott, Lawns owner Darren Oliver, Margaret Underhill (who is taking over Chris’ role), Becky Tolley, Chris Caldicott, Dave Dixon.